The vibrant aromas of lime, basil and green pepper come from fruit harvested in the Awatere Valley, as do the lively, intense, juicy flavours of fresh ripe redcurrants and gooseberries. This stylish Sauvignon Blanc is the perfect apéritif and accompaniment to fish, seafood or chicken. 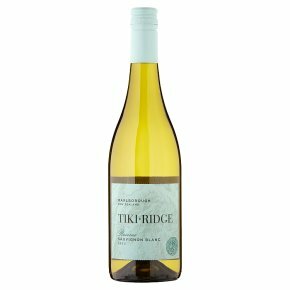 Wine of Marlborough, New Zealand.Tiki Ridge Reserve is a beautifully crafted wine and a classic expression of the Marlborough style. With the inclusion of grapes from Marlborough's cooler Awatere Valley, the wine expresses vibrant aromas of lime, basil and green pepper. Lively and intense with juicy flavours of ripe redcurrant and gooseberry, this stylish Sauvignon Blanc is the perfect accompaniment to fish, seafood, chicken and Asian cuisine.